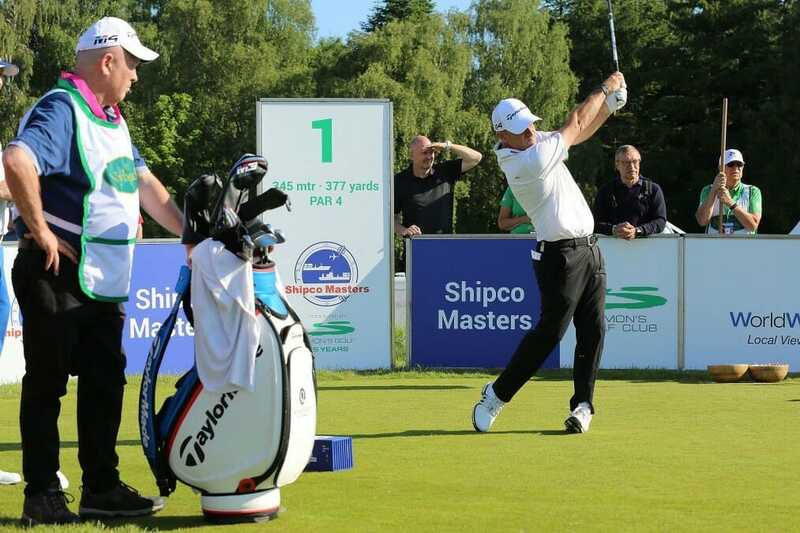 Brendan McGovern showed no ill-effects from his US PGA missed cut as he signed for a four-under-par 68 to sit just two shots off the lead after round one of the inaugural Shipco Masters promoted by Simon’s Golf Club in Denmark. The Headfort professional fired four birdies with no bogeys in sight to grab a share of sixth spot after a fine opening effort. McGovern has two familiar faces just one shot back after both Des Smyth and Paul McGinley rolled back the years to card opening three-under-par rounds of 69. Smyth dropped just the one stroke and McGinley three with Ireland well represented on page one of the Copenhagen leaderboard. However the day wasn’t so great for Phillip Walton who opened with a five-over-par 77 to find himself with work to do in a tie for 49th. Rafael Gomez leads in Denmark after carding an opening round of 66. Gomez, who won the Staysure Tour Qualifying School in February, recorded eight birdies and just two blemishes at the sun-kissed Kvistgård venue in the tour’s first event on European soil this season. He took advantage of the back-to-back par five finish to overtake four players on five under par late on in the opening round and end Day One as the outright leader. The Argentinian, playing in his second Staysure Tour event, finished both nines with a trio of consecutive birdies during an impressive six under par first round, earning the 50 year old a one-stroke lead over Peter Baker, Paul Eales, James Kingston and Barry Lane. Following a fine first day’s work the two-time European Challenge Tour champion is happy with his game – but believes he still has a lot of work to do if he is to challenge for a first Staysure Tour title. “I’m very happy,” said Gomez. “I played fantastic today. I made two bogeys but I hit my driver great and putted really well. “I’m very happy with my finish because they are very important holes. I made the birdies at the right times. The last three holes are very important, especially when you have two par fives, so I’m very happy to finish like that. The most important thing today was to hit a good drive and get the right line, so I could be close on the greens. Behind Gomez is a chasing pack eager to pounce and ready to put their claim in for the inaugural title. Baker finished early in the afternoon and joined fellow former Ryder Cup player Lane, along with Eales and Kingston, at the top on five under par. The three-time European Tour winner did not drop a shot as he holed five birdies on the way to a five under round of 67. However, with Gomez a shot ahead, the Englishman was disappointed not to be in a share of the first round lead, especially with the chances he had on his closing two holes.